The signs had to work in daylight, low light and artificial light, in outdoor conditions and luxury suites. 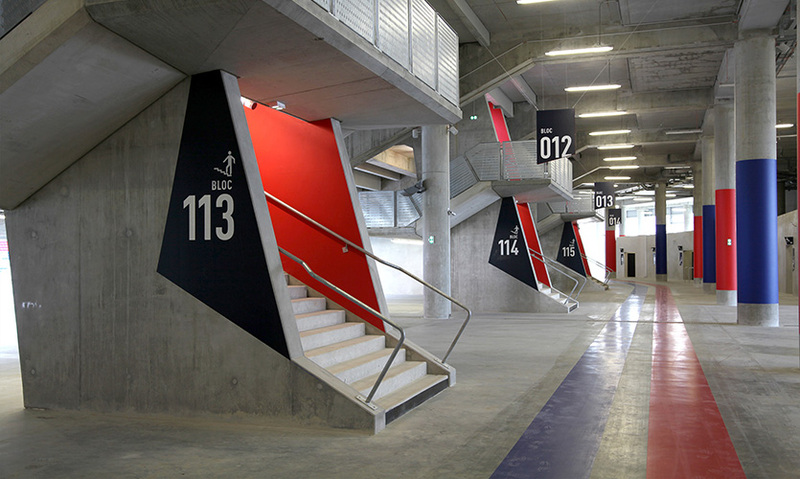 They also had to heighten the aesthetic of the building and breathe the spirit of Olympique Lyonnais. 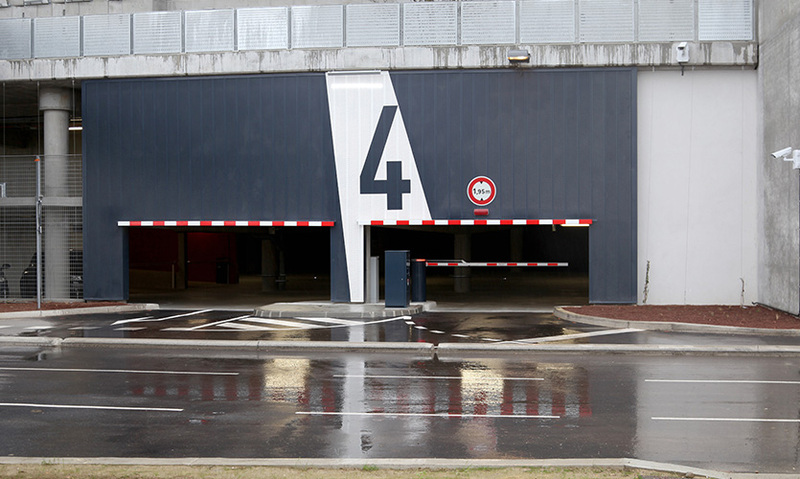 The new building presented an opportunity to provide user-friendly naming, numbering and directions from car parks to seats, delivered through elegant, robustly functional signs. The overarching approach to signage was to use big target signs that, in the first instance, could be painted directly to target functions or, where necessary, could be integrated harmoniously with the surroundings. The Populous team chose the color palette for functionality and contrast, with a nod to the team’s colors. 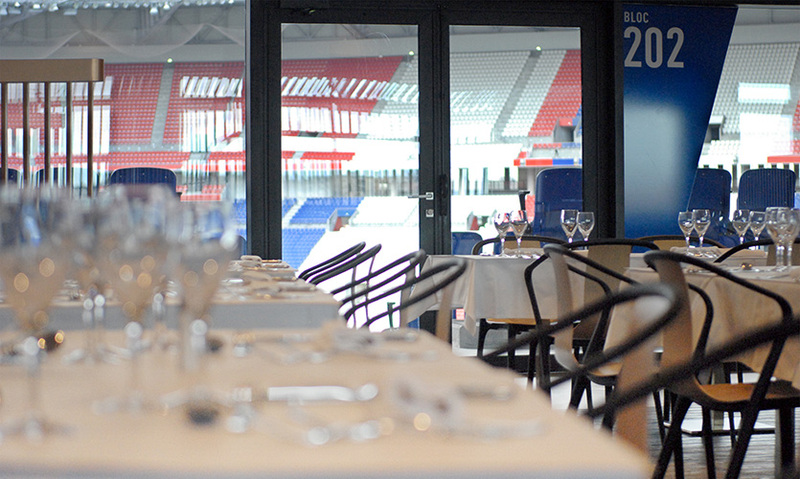 They specified DIN, a proven signage type and coincidentally also the Olympique Lyonnais brand typeface, as the project typeface. The size and complexity of the building and surroundings posed particular wayfinding challenges. 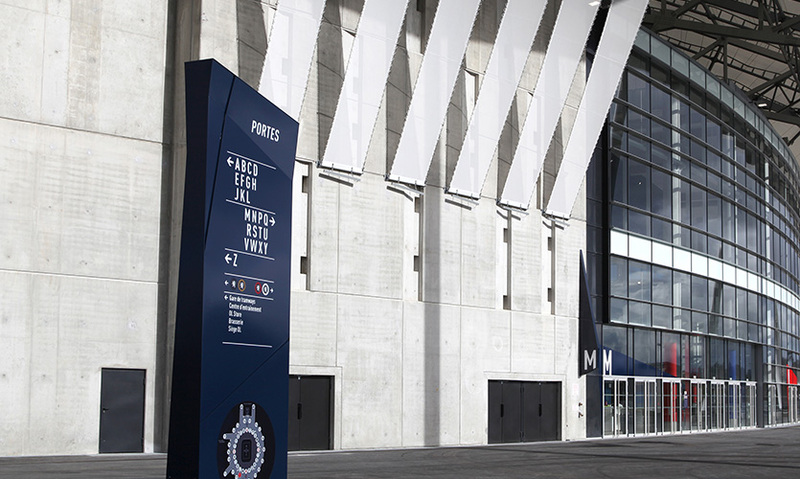 The stadium is circled by a raised pedestrian area, nearly two kilometers in circumference, connecting it to large underground and outdoor car parks and tram and bus services. Specific entrances lead to specific floors or areas inside the building, making the correct identification of entrances paramount. Entrances were given unique letters and identified by illuminated blades that taper into the mass of the building to echo the geometry of the roof. 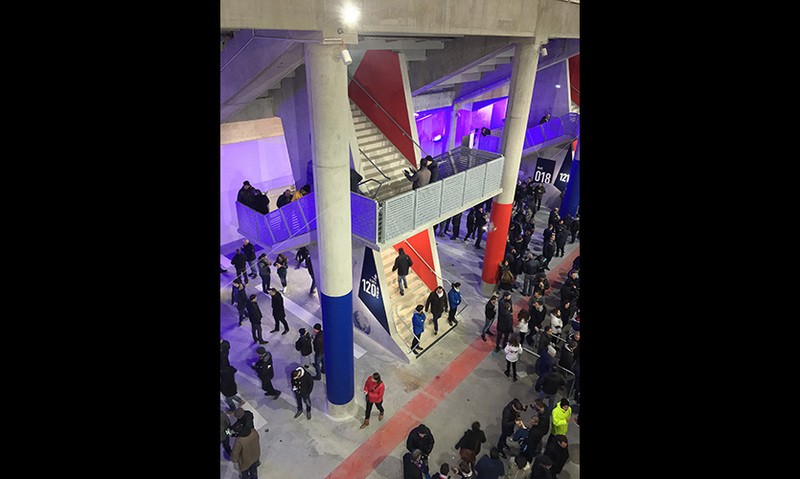 Inside the stadium, the ground level is a big, open concourse with dramatic views onto the field of play, punctuated by concrete stairs that load mid-tier seats. The area demanded clear target signs that would have presence in the space but not clutter it. They achieved this through the economical use of signs painted on available surfaces, with signs elegantly suspended only when necessary. 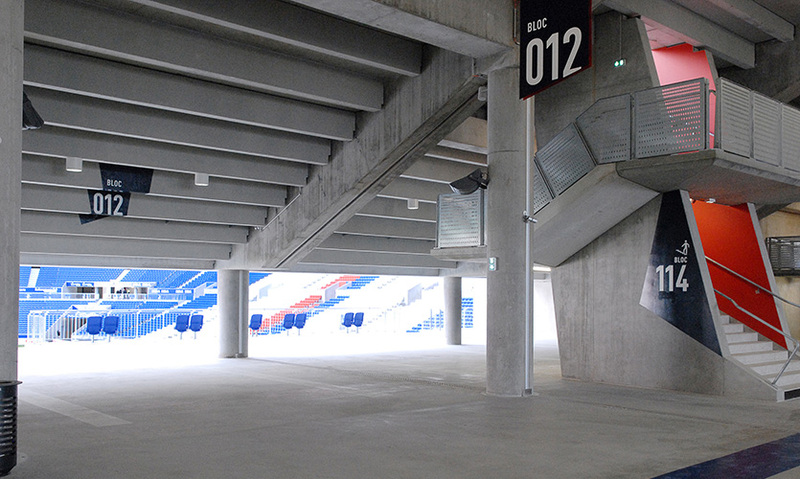 In the upper bowl, the sheer size of the building means one vomitory feeds people into three seating areas. These blocks were named using an innovative ABC system, designed to be quickly understandable in a highly pressurized area, and labeled using attention-grabbing signs painted on vomitory walls. 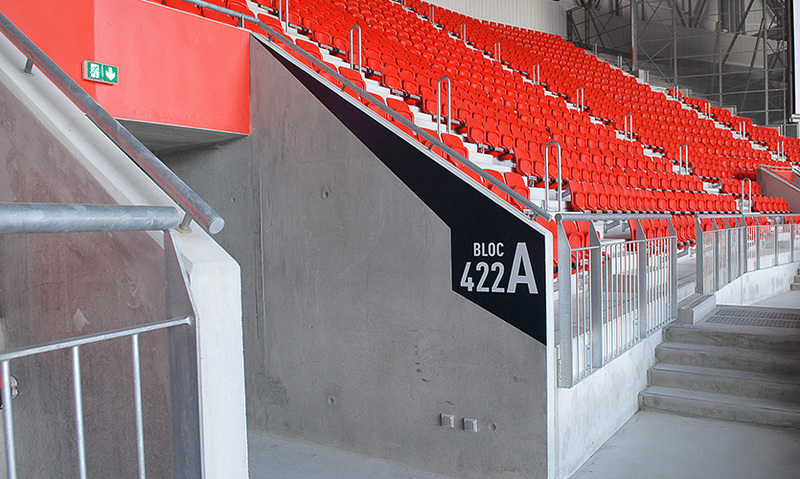 Another feature of the stadium that needed careful signing was the toilets, some of which can be switched to serve men or women depending on the likely ratio of men to women in attendance. 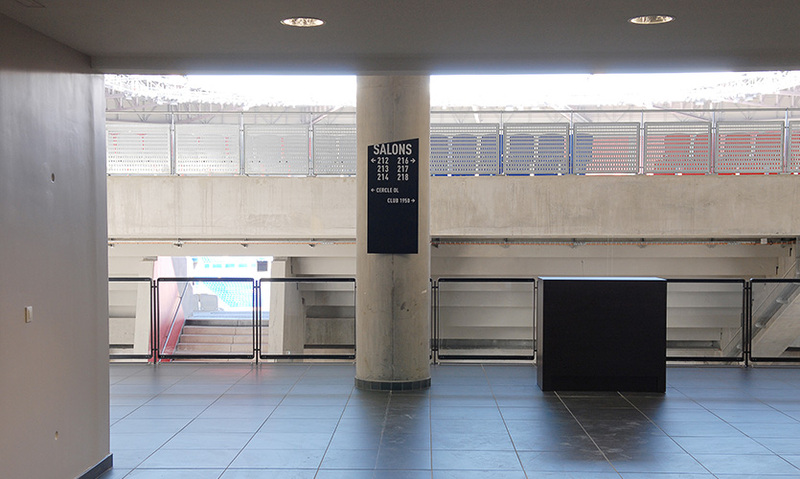 The toilet blocks are identified with signs that are conspicuous from the far end of the concourse without being exaggeratedly large. Where toilets change function between men and women, the signs can be flipped easily using an ingenious locking system. 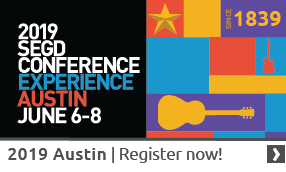 "Wayfinding seamlessly integrated within the built environment, creating the ideal holistic end-user experience for patrons." "Bold simplicity and clarity are attributes of this project. The wayfinding information system has logic and order and is accessible for persons of any language ability. Taking cues from the architecture of the roof and interior structure, the angularity of the graphic components gives them distinctiveness to stand out in the environment. Limited color coordination is an attribute, as it distinguishes major sections of the seating areas. This project exemplifies the manner in which a large sports venue can be used for multiple sports and customized to reflect the individual character of any event."